After many years of worrying about amphibian declines and trying to pinpoint the exact cause of the problem, scientists are now faced with an even more serious problem. The declines have become so severe that scientists are now watching their study animals become extinct. 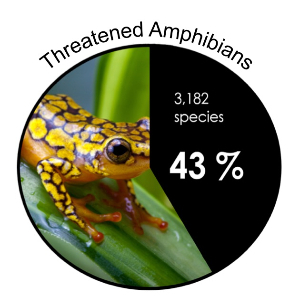 We have now moved into the phase of amphibian extinctions rather than studying amphibian declines and 43% of all amphibians are threatened with extinction. When a whole group of a particular type of animal starts to disappear then we need to worry. Amphibians play an essential part in the food web of life as top insectivores and prey to many other animals, and if you remove this important link then one can only guess about the ramifications, but there is no doubt that they will be serious. The text below contains information on the main causes of amphibian extinctions. Straight out of The X-Files the phenomenon of disappearing frog populations became public knowledge……. Scully unaware of Mulder's 'Big Blue creature' theory questions Mulder about their involvement in the case in the car,... they speak with local biologist Dr Farraday, who dismisses the existence of a creature like Big Blue in the lake..... Dr Farraday reports that the local frog populations have declined drastically in the lake leading Mulder to theorise that Big Blue is being forced ashore in search of food. (The X-Files, Season 3 Episode22 - Quagmire). The issue of declining frog populations was first highlighted in 1989 when a rather large group of over 1400 from 60 countries throughout the world, descended upon the delightful town of Canterbury in the UK for the First World Congress of Herpetology. It was at this meeting that a disturbing number of researchers reported apparent declines in their study populations and of growing concern were the reports of declining populations from seemingly pristine habitats. We are now nearly 20 years down the line, with over 250 publications being produced relating to global amphibian declines and as yet we are not much further ahead in identifying the cause. Throughout the World over 200 amphibian species have experienced recent population declines, with reports of at least 32 species extinctions. Far too often we see depressing sights of blatant habitat destruction, and with the ever increasing human population, habitat destruction and fragmentation will become even more commonplace. It is now estimated that humans have altered between one third and one half of the Earth’s land surface. Forestry and agriculture take a major toll on frog populations. In fact habitat destruction and alteration is the main objective of most farmers. It has also been demonstrated that roads and agricultural fields are significant barriers to terrestrial arthropods and small mammals and the same is probably true for amphibians. Mining also constitutes a major threat to amphibians, not only through the associated water pollution but also through the mechanical destruction of frogs themselves as well as their habitat. Frogs vary a great deal in their tolerance to acid water. Tadpoles tolerate acidity better than embryos (fertilisation being the most sensitive developmental stage to acidity), and tolerance increases with age. Many frogs breed in temporary pools that fill up with rain. The acidity of these pools may be strongly influenced by the acidity of the rain and therefore may be considerably more acidic than that of nearby ponds and lakes. Acidification will probably constitute a major threat to our frogs. Aluminium, cadmium, copper, zinc and iron are all toxic to amphibians. We can also infer from studies on fish that nickel, lead, and manganese will have damaging effects on frog populations. It has also been demonstrated that large amounts of lead, from car exhaust gases, are deposited into major water bodies. We can expect heavy metals to play a leading role in the downfall of our frogs. Organic herbicides and pesticides often cause developmental abnormalities or fatalities. A report in 1997 demonstrated that the widely used and apparently safe herbicide “Roundup” was extremely toxic to tadpoles and adult frogs. This herbicide (in its new and apparently safe form) is still widely used by farmers, foresters and gardeners of New Zealand. Obviously, the insecticides DDT and Dieldrin are dangerously toxic at very low levels and at present we know very little about rates of degradation under field conditions. Certain chemicals such as DDT and PCBs mimic hormones and can cause sterility in a number of frog species and may possibly influence the fertility of humans. Atrazine, a major herbicide used in New Zealand has been blamed for the chemical castration of frogs (and other animals, possibly humans). Prof Tyrone Hayes visited the Otago NZFROG in June in 2007. More information about this can be found on his website. The greenhouse effect was described more than 100 years ago and its effect on our planet was well understood. Global climate change can affect our frog populations directly or indirectly. Direct effects – the timing of breeding by amphibians is governed by environmental factors such as temperature. It is thought that if global warming occurs then the breeding season of frogs will change and frogs will start breeding earlier. This is exactly what is found in many populations, with the frogs coming out of hibernation earlier being more susceptible to sudden cold changes in the weather. Current general circulation models predict that a doubling of the present carbon dioxide will occur in the second half of this century predicting an increase of the mean Earth’s surface temperature by 4 C. This will result in an increase in sea level by over 2 m which apart from destroying many areas of human habitation will inundate most of the world’s coastal wetlands. From our amphibian point of view it is all doom and gloom - there will be an alteration of rainfall patterns, more frequent and intense droughts, and this coupled with acid rain and pollutants only exacerbates the problems faced by our moist friends. Indirect effects – it is possible that these adverse climatic conditions may have very subtle effects on frogs, such as depression of immune function causing the frogs to become more susceptible to disease. In addition there may be even more complex subtle effects where the lower pond water levels, will cause the embryos to be exposed to more UV light from the sun causing them to be even more susceptible to fungal attacks. It has been suggested that the widespread distribution of amphibian declines involves global agents such as an increase in ultra-violet radiation (in particular UV-B at a wavelength of 300 nm. UVB radiation is no doubt very harmful to many species of amphibians, however the literature surrounding the effects of UV on frog populations is highly controversial and requires much more work before this can be determined to be a serious threat. Predators - In the United States, Australia and New Zealand there have been several populations of amphibians that have declined as a direct result of predation by freshwater crayfish, bullfrogs, cane toads, and rats. In this country the fish commonly known as mosquito fish have been found to be major predators on tadpoles and native fish and I suspect that this invasive species will play a major role in the demise of local populations of introduced frogs. In Australia there is a movement to change the name of this fish to “plague minnow” as they have been shown to be a voracious predator and extremely hardy of salty, acidic or hot conditions - I even found them swimming around in some thermal pools at Rotorua. It is thought that the major agent of decline of our native frogs was the introduction of mammalian predators such as kiore, mice and the Mustelids (stoats, weasels etc). Diseases – Diseases have been implicated in many amphibian declines. Viral, bacterial and fungal diseases have been reported as the major agents in the declines of many species. In New Zealand a recent outbreak of the chytrid (pronounced ‘kit-rid’) fungus caused a mass die-off of Archey’s frog in the Coromandel, resulting in an emergency meeting of the Native Frog Recovery group. Archey’s frog is now listed as Nationally Critical and steps are in place to prevent its extinction. Another possible cause of global declines is the collection of frogs as a food source. Africa, United States, Germany, France and the Netherlands consume millions of frogs annually. For example, the United States has been recorded as importing more than 3 million kg of frog meat per year. That is the equivalent of approximately 26 million frogs! The pet trade, which is a multi-million dollar business, also plays an important role and generally the rarer the species the higher the demand and the rarer the frog becomes. Frogs caught in the wild for the pet trade are often kept in crowded cages awaiting final shipment to the United States. These animals are kept in very stressful conditions, and the ones that do make it alive to the United States usually only last a couple of months in captivity before being unceremoniously flushed down the toilet. New Zealand has one of the rarest frogs in the world and the demand for this species in the pet trade or by fanatical collectors is very high, and it is only due to the hard work of the Department of Conservation and the frogs inaccessible habitat that enable this frog to survive today. The whole picture itself of declining populations is not an easy one to unravel as many of these causative factors interact and intensify the problems facing the frogs. For example, while only large doses of UVB are necessary to cause substantial mortality, smaller doses may increase the amount of stress on tadpoles making them more susceptible to diseases. Also, acidity has been shown to seriously affect the toxicity of different metals on different species of frogs. Consequently, all these factors are interrelated and a complex web of stresses may be causing the demise of many populations, and this intricate nature prevents the isolation of one causative factor. Why should we be concerned about frogs, they are lowly creatures after all? As they are major predators of insects they fulfil an important role in the food chains and without them insects can multiply out of control causing considerable damage to crops and a dramatic increase in insect borne diseases such as encephalitis and malaria. As we have seen most frogs have a biphasic life cycle, where eggs laid in water, develop into tadpoles and these live in the water until they metamorphose into tiny replicas of the adults. This fact, coupled with being covered by a semi-permeable skin, makes frogs particularly vulnerable to pollutants and other environmental stresses. Consequently frogs can be used as environmental sentinels or biomonitors and act as an early warning system for the quality of the environment and the potential threats to other animals including ourselves. In addition frogs throughout the world provide a valuable source of food for humans and other animals.